I have been reading and writing middle grade fiction for many years now because my youngest is 11 years old. I miss reading to him and thought I would check different blogs to see what's new in picture books. 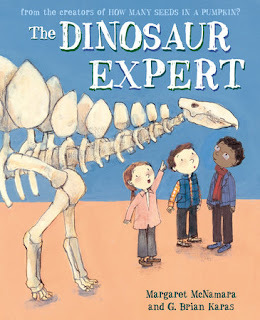 The Dinosaur Expert looks terrific and I can't wait to read it and share the title with a friend who is a school librarian. Thanks for sharing! I love G Brian Karas’ work! Thanks for introducing me to this one. What a great twist on a dinosaur book -- encouraging girls to think about being scientists. Enjoyed your activities at the end. Perfect classroom book! Honestly, a school elementary library can never have enough good dinosaur books! Oooh - can't wait to read! And I love your activities.